PLEASE READ UPDATE: While the API for checking for updates has changed, the update model *after* that method call to CheckAndDownloadUpdateAsync is the same as described below. See this note for updates since this article to the Out-of-browser experiences. So, instead of trying to cram it in 140 characters, I’ll explain here how it works, and take the liberty of using just slightly more than 140 characters. If you aren’t familiar with the Silverlight Out-of-browser experiences (lovingly referred to as a SLOOB – nod to @bryantlikes), you may want to read my previous post which is a guide to the new features in Silverlight 3 as well as view this video demonstrating the feature. Notice the HTTP 304 Not Modified response. No further information is sent and we can see that no content was even delivered. The app hasn’t changed. At the API level, Application.Current.ExecutionState is not triggered for a DetachedUpdatesAvailable state change. Application.Current.ExecutionState changes to a DetachedUpdatesAvailable state. The XAP in the local storage location is updated to the new bits. And that’s the basic mechanism of it. When an application is detached, metadata is stored about that app. Each launch it does a check against that metadata to see if an update is visible. If the app is offline, that’s fine, it won’t block the app from launching. This is very similar to the .NET Framework’s ClickOnce concept in deployment. 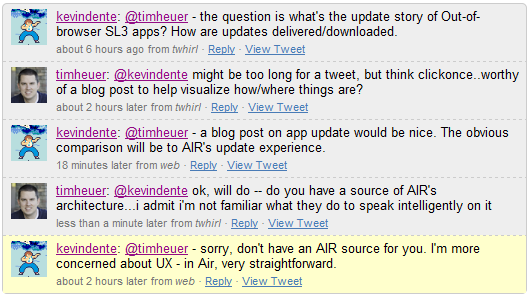 Kevin asked me to contrast that with how AIR does it because he felt that “in AIR, very straightforward.” Now, as you can also see in the initial conversation, I admitted not knowing how AIR worked. I’m basing the following (and I won’t go deep to get myself into “you’re an idiot” trouble) off of my research in the Adobe AIR developer tutorial on Using the Adobe AIR Update Framework. Now as far as I can tell, first the update framework is not a part of the core AIR runtime and [UPDATE] is avialable in the AIR 1.5 SDK (thanks David for the note) is a separate plugin/module/whatever-term-would-be-appropriate-for-the-runtime for AIR. Mihai in the tutorial points to needing to download the update framework which apparently is a lab framework (I’m not sure if that means beta, supported or what – if someone knows please comment)? This is a small XML file that keeps information needed by the updater (for example, what version is available, from where to take it, and what info to display). This file sits on your server, and when the application starts up it loads this file to see if any updates are available. I like the default UI, it’s informative. Notice the Release Notes information. This information comes from the manifest file. I like that too…good idea. What it appears to me though is that when the developer has an update the manifest needs to be manually updated or no update events would be triggered. Perhaps that’s a good thing for granular control over optional events. I couldn’t find information if you can modify whether “Download Later” was an option or not (thus forcing an update). So there you have it. In Silverlight 3 you have a framework to enable you to auto update your bits. We’re still in beta so things may change and we know there are questions that you may have on our model (if you have those questions, please leave a comment here). In AIR you have a framework that doesn’t appear to be a part of the core runtime but that provides the same methods for providing notification to your users. If I’ve gotten my interpretation of the AIR tutorial wrong, please someone kindly correct me as it wouldn’t have been my intent to do so. I hope this helps understand the model. If it didn’t, then perhaps I should have just used 140 characters.